In 1825 at age 19, Maury obtained, through the then-US Congressman Sam Houston, a midshipman's warrant in the United States Navy. As a midshipman on board the frigate USS Brandywine. Almost immediately he began to study the seas and record methods of navigation. When a leg injury left him unfit for sea duty, Maury devoted his time to the study of navigation, meteorology, winds, and currents. He became Superintendent of the U.S. Naval Observatory and head of the Depot of Charts and Instruments. Here, Maury studied thousands of ships' logs and charts. He published the Wind and Current Chart of the North Atlantic, which showed sailors how to use the ocean's currents and winds to their advantage and drastically reduced the length of ocean voyages. Maury's uniform system of recording oceanographic data was adopted by navies and merchant marines around the world and was used to develop charts for all the major trade routes. With the outbreak of the Civil War, Maury, a Virginian, resigned his commission as a US Navy commander and joined the Confederacy. He spent the war in the South, as well as abroad in Great Britain, Ireland, and France. 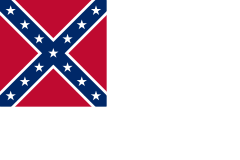 He helped acquire a ship, CSS Georgia, for the Confederacy while also advocating stopping the war in America among several European Nations. Following the war, Maury accepted a teaching position at the Virginia Military Institute in Lexington, Virginia. He died at his V.M.I. home in Lexington in 1873 after completing an exhausting state-to-state lecture tour on national and international weather forecasting on land. He had also completed his book on his Geological Survey of Virginia and a new series of geography for young people. Maury was a descendant of a prominent Virginia family of Huguenot ancestry whose ancestry can be traced back to 15th century France. Matthew Fontaine Maury's grandfather (the Reverend James Maury) was an inspiring teacher to a future U.S. president, Thomas Jefferson. Maury also had Dutch-American ancestry from the "Minor" family of early Virginia. M. F. Maury was born in 1806 in Spotsylvania County, Virginia near the City of Fredericksburg; his parents were Richard Maury and Diane Minor Maury. The family moved to Franklin, Tennessee, when he was age five. He wanted to emulate the naval career of his older brother, Flag Lieutenant John Minor Maury, who however caught yellow fever after fighting pirates as an officer in the United States Navy. As a result of John's painful death, Matthew Maury's father, Richard, forbade him from joining the Navy. 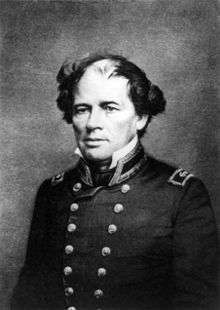 Maury strongly considered attending West Point to get a better education than the navy could offer at that time, but instead he obtained a Naval appointment through the influence of Senator Sam Houston, a family friend, in 1825, at the age of 19. Maury joined the Navy as a midshipman on board the frigate Brandywine which was carrying the Marquis de La Fayette home to France following the Marquis' famous visit to the United States. Almost immediately, Maury began to study the seas and record methods of navigation. One of the experiences that piqued this interest was a circumnavigation of the globe on the USS Vincennes, his assigned ship and the first US warship to travel around the world. As officer-in-charge of the United States Navy office in Washington, DC called the "Depot of Charts and Instruments" the young lieutenant became a librarian of the many unorganized log books and records in 1842. From his initiative he sought to improve seamanship through organizing the information in his office and instituting a reporting system among the nation's shipmasters to gather further information on sea conditions and observations. The product of his work was international recognition and the publication in 1847 of "Wind and Current Chart of the North Atlantic". 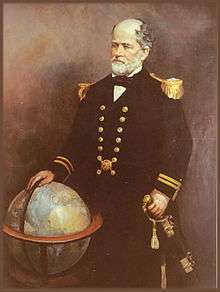 His international recognition assisted in the change of purpose and name of the depot to the United States Naval Observatory and Hydrographical Office in 1854. He continued holding that position until his resignation in April 1861. Maury was one of the principal advocates for the founding of a national observatory, and appealed to science enthusiast and former U.S. President, Congressman John Quincy Adams for the creation of what would eventually become the Naval Observatory. Maury did, on occasion, host Congressman Adams, who enjoyed astronomy as an avocation, at the Naval Observatory. Concerned that Maury always had a long trek to and from his home on upper Pennsylvania Avenue, Adams introduced an appropriations bill that funded a Superintendent's House on the Observatory grounds (a large mansion was built on the site in the 1890s for the Chief of Naval Operations which as Number One Observatory Circle has now been converted into the official residence of the Vice-President of the United States). Thus, Adams now felt no constraints in regularly stopping by for a look through the facility's telescope. As a sailor, Maury noted that there were numerous lessons that had been learned by ship-masters about the effects of adverse winds and drift currents on the path of a ship. The captains recorded these lessons faithfully in their logbooks, but they were then forgotten. At the Observatory, Maury uncovered an enormous collection of thousands of old ships' logs and charts in storage in trunks dating back to the start of the United States Navy. Maury pored over these documents to collect information on winds, calms, and currents for all seas in all seasons. His dream was to put this information in the hands of all captains. Maury also used the old ships' logs to chart the migration of whales. Whalers at the time went to sea, sometimes for years, without knowing that whales migrate and that their paths could be charted. Maury's work on ocean currents led him to advocate his theory of the Northwest Passage, as well as the hypothesis that an area in the ocean near the North Pole is occasionally free of ice. The reasoning behind this was sound. Logs of old whaler ships indicated the designs and markings of harpoons. Harpoons found in captured whales in the Atlantic had been shot by ships in the Pacific and vice versa, and this occurred with a frequency that would have been impossible had the whales traveled around Cape Horn. Maury, knowing a whale to be a mammal, theorized that a northern passage between the oceans that was free of ice must exist to enable the whales to surface and breathe. This became a popular idea that inspired many explorers to seek a reliably navigable sea route. Many of those explorers died in their search. Lieutenant Maury published his Wind and Current Chart of the North Atlantic, which showed sailors how to use the ocean's currents and winds to their advantage and drastically reduced the length of ocean voyages; his Sailing Directions and Physical Geography of the Seas and Its Meteorology remain standard. Maury's uniform system of recording synoptic oceanographic data was adopted by navies and merchant marines around the world and was used to develop charts for all the major trade routes. Maury's Naval Observatory team included midshipmen assigned to him: James Melville Gilliss, Lieutenants John Mercer Brooke, William Lewis Herndon, Lardner Gibbon, Lieutenants Isaac Strain, John "Jack" Minor Maury II of the USN 1854 Darien Exploration Expedition, and others. Their duty was always temporary at the Observatory, and new men had to be trained over and over again. 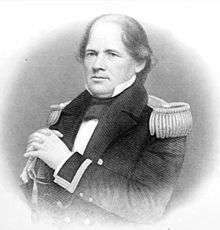 Thus Lt. Matthew Fontaine Maury was working with astronomical work and nautical work at the same time, while constantly training new temporary men to assist in these works. As Maury's reputation grew, the competition among young midshipmen to be assigned to work with him intensified. He always had able assistants even though they constantly were changing and being reassigned as part of their duties. Maury advocated much in the way of naval reform, including a school for the Navy that would rival the army's West Point. This reform was heavily pushed by Maury's many "Scraps from the Lucky Bag" and other articles printed in the newspapers and many changes came about in the navy including his finally fulfilled dream of the creation of the United States Naval Academy. During its first 1848 meeting, Maury helped launch the American Association for the Advancement of Science (AAAS). In 1849, Maury spoke out on the need for a transcontinental railroad to join the eastern United States to California. He recommended a southerly route with Memphis, Tennessee as the eastern terminus, since the city is equidistant from Lake Michigan and the Gulf of Mexico. He argued that a southerly route running through Texas would avoid winter snows and could open up commerce with the northern states of Mexico. Maury also advocated construction of a railroad across the Isthmus of Panama. Maury also called for an international sea and land weather service. Having charted the seas and currents, he worked on charting land weather forecasting. Congress refused to appropriate funds for a land system of weather observations. Maury early became convinced that adequate scientific knowledge of the sea could be obtained only through international cooperation. He proposed that the United States invite the maritime nations of the world to a conference to establish a "universal system" of meteorology, and he was the leading spirit of a pioneer scientific conference when it met in Brussels in 1853. Within a few years, nations owning three-fourths of the shipping of the world were sending their oceanographic observations to Maury at the Naval Observatory, where the information was evaluated and the results given worldwide distribution. As its representative at the conference, the U.S. sent Maury. As a result of the Brussels conference a large number of nations, including many traditional enemies, agreed to cooperate in the sharing of land and sea weather data using uniform standards. It was soon after the Brussels conference when Prussia, Spain, Sardinia, the free city of Hamburg, the republic of Bremen, Chile, Austria, and Brazil, and others all joined the enterprise. The Pope established honorary flags of distinction for the ships of the papal states, which could be awarded only to those vessels which filled out and sent to Maury in Washington D.C. the Maury abstract logs. Maury started a campaign to force Brazilian Government to open up navigation in the Amazon river and to oblige it to receive the American colonizers and American Trade. But D. Pedro II's government firmly rejected the proposals. The Imperial Government had in mind US traditional process of territorial annexations in Latin America: immigration, provocation, conflict and annexation. So, Brazil acted diplomatically and through the press to avoid, by all means, the colonization proposed by Maury. By 1855, Maury´s project had certainly failed. Brazil authorized free navigation to all nations in the Amazon only in 1866 but only when it was at war against Paraguay and the free navigation in the area became necessary. With the outbreak of the American Civil War, Maury, a native of Virginia, ended the career that he dearly loved by handing in his commission as a US Navy commander to serve Virginia, which had joined the Confederacy, as Chief of Sea Coast, River and Harbor Defences. Because he was an international figure, he was ordered to go abroad for many reasons including propaganda for the Confederacy, for peace, and for purchasing ships. He also went to England, Ireland, and France, acquiring ships and supplies for the Confederacy. Through speeches and newspaper publications, Maury tried desperately to get other nations to stop the American Civil War, carrying pleas for peace in one hand and a sword in the other, each to deal with whatever the outcome. Maury also perfected an "electric torpedo" (naval mine) which raised havoc with northern shipping. Maury had experience with the transatlantic cable and electricity flowing through wires underwater when working with Cyrus West Field and Samuel Finley Breese Morse. The torpedoes, similar to present-day contact mines, were said by the Secretary of the Navy in 1865 "to have cost the Union more vessels than all other causes combined." The war brought ruin to many in Fredericksburg, Virginia, where Maury's immediate family lived. Thus, returning there was not immediately considered. Following the war, after serving Maximilian in Mexico as "Imperial Commissioner of Immigration" and building Carlotta and New Virginia Colony for displaced Confederates and immigrants from other lands, Maury accepted a teaching position at the Virginia Military Institute (V.M.I. ), holding the chair of physics. Maury advocated the creation of an agricultural college to complement VMI. This led to the establishment of the Virginia Agricultural and Mechanical College (Virginia Tech) in Blacksburg, Virginia in 1872. Maury declined the offer to become its first president partly because of his age. He had previously been suggested as president of the College of William and Mary in Williamsburg, Virginia in 1848 by Benjamin Blake Minor in his publication the Southern Literary Messenger. Maury considered becoming president of St. John's College in Annapolis Maryland, the University of Alabama, and the University of Tennessee. It appears that he preferred being close to General Robert E. Lee in Lexington from statements Maury made in letters. Maury served as a pall bearer for General Lee. During his time at VMI, Maury wrote a book entitled The Physical Geography of Virginia. He had once been a gold mining superintendent outside of Fredericksburg, Virginia, and had studied geology intensely during that time, so was well equipped to write such a book. During the Civil War, more battles took place in Virginia than any other state (Tennessee was second), and Maury's aim was to assist war-torn Virginia in discovering and extracting minerals, improving farming and whatever else could assist her to rebuild after such destruction. Maury later gave talks in Europe about cooperation on a weather bureau for land just as he had charted the winds and predicted storms at sea many years before. He gave these Weather on Land speeches until his last days when he collapsed giving a speech. He went home after he recovered and told Ann Hull Herndon-Maury, his wife, "I have come home to die." Matthew Fontaine Maury died at home in Lexington at 12:40 pm, on Saturday, February 1, 1873. He was exhausted from traveling throughout this nation while giving speeches promoting Land Meteorology. He was attended by his eldest son, Major Richard Launcelot Maury and son-in- law, Major Spottswood Wellford Corbin. Maury asked his daughters and wife to leave the room. His last words were, "All's well", a nautical expression telling of calm conditions at sea. His body was placed on display in the Virginia Military Institute library. Maury was initially buried in the Gilham family vault in Lexington's cemetery, across from Thomas "Stonewall" Jackson, until, after some delay into the next year, when his remains were taken through Goshen Pass to Richmond, Virginia. He was reburied between presidents James Monroe and John Tyler in Hollywood Cemetery in Richmond, Virginia. After decades of national and international hard work averaging 14 hours per day, Maury received fame and honors, including being knighted by several nations and given medals with precious gems, as well as a collection of all medals struck by Pope Pius IX during his pontificate, a book dedication and more from Father Angelo Secchi, who was a student of Maury from 1848–1849 in the U.S. Naval Observatory. The two remained lifelong friends. Other religious friends of Maury included James Hervey Otey, M. F. Maury's former teacher who, before 1857, worked with Bishop Leonidas Polk on the construction of the University of the South in Tennessee. While visiting there, Maury was convinced by his old teacher to give the "cornerstone speech". As a United States Navy officer, he declined awards from foreign nations as their acceptance was against U.S. military policy. However, they were offered to Maury's wife, Ann Hull Herndon-Maury, who accepted them for her husband. Some have been placed at Virginia Military Institute, others were loaned to the Smithsonian and yet others remain in the family. Matthew Maury became a Commodore (often a title of courtesy) in the Virginia Provisional Navy, and a Commander in the Confederacy. 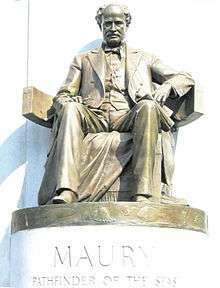 A monument to Maury, by sculptor Frederick William Sievers, was unveiled in Richmond on November 11, 1929. Maury Hall, the home of the Naval Science Department at the University of Virginia and headquarters of the University's Navy ROTC battalion, was named in his honor. The original building of the College of William & Mary Virginia Institute of Marine Science is named Maury Hall as well. Another Maury Hall, named after him, houses the Electrical and Computer Engineering Department and the Systems Engineering Department at the United States Naval Academy in Annapolis, Maryland. Ships have been named in his honor, including three United States Navy ships named USS Maury. A fourth U.S. Navy ship named in his honor was the USS Commodore Maury (SP-656), patrol vessel and mine sweeper. of World War I. A World War II Liberty Ship was also named in his honor. Additionally, Tidewater Community College, based in Norfolk Virginia, owns the R/V Matthew F. Maury. This ship is used for Oceanography research and student cruises. In March, 2013, in Maury's honor, the U.S. Navy launched the USNS Maury in Mississippi. The Maury is designed to be an oceanographic survey ship for the Navy. Lake Maury in Newport News, Virginia is named after Maury. The lake is located on the Mariners' Museum property and is encircled by a walking trail. The Maury River, located entirely in Rockbridge County, Virginia, near Virginia Military Institute (where Maury was on faculty), also honors the scientist, as does a Maury crater on the Moon. Additionally, a high school in Norfolk, VA is named for Maury, and has been ranked in the top 1000 high schools in the country, and the highest in the city, by Newsweek. Matthew Fontaine Maury High School is located in Norfolk Public Schools which was named the Best Urban School District last year. Maury County, TN is named for his great-uncle. Also, Maury Elementary School, in Alexandria, Virginia, was named for Matthew Maury. Maury Elementary was built in 1926. James Madison University has a Maury Hall named in honor of Matthew Fontaine Maury. This was the university's first academic and administrative building. Dan Graves listed Matthew Maury among his 48 great Scientists of Faith on grounds that: Maury lived by the Scriptures; he fully and unconditionally believed in what the Holy Scriptures stated; he hardly ever spoke or wrote without the inclusion of scriptural references; he prayed every day. Numerous historical markers commemorate Maury throughout the South, including those in Richmond, Virginia, Fletcher, North Carolina, and several in Chancellorsville, Virginia. 1 2 3 Diana Fontaine Maury-Corbin "Life of Matthew Fontaine Maury USN & CSN" Life of Matthew Fontaine Maury, U.S.N. and C.S.N. 1 2 Bowditch, Nathaniel. (1966). "U.S. Hydrographic Office". American Practical Navigator: an Epitome of Navigation. Washington, DC: U.S. Government Printing Office. p. 31. ↑ Sigafoos, R.A. Cotton Row to Beale Street: A business history of Memphis. Memphis State University Press, 1979. p. 19. ↑ Charles Lee Lewis, associate professor of the United States Naval Academy, Matthew Fontaine Maury: The Pathfinder of the Seas (1927) Annapolis. ISBN 0-405-13045-7 Reprinted (1980). ↑ Charles Lee Lewis (June 1980). Matthew Fontaine Maury. Ayer Publishing. ISBN 978-0-405-13045-8. Retrieved September 14, 2011. ↑ The Historical Marker Database: Matthew Fontaine Maury. 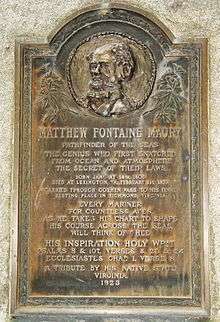 ↑ The Historical Marker Database: Matthew Fontaine Maury: Pathfinder of the Seas, The Historical Marker Database: Matthew Fontaine Maury: Birthplace of Matthew Fontaine Maury (1806-1873) and The Historical Marker Database: Matthew Fontaine Maury: Maury House Trail. Flying Cloud – An 1851 true story of America's most famous clipper ship that raced other ships from New York, around Cape Horn, to San Francisco by using both Maury's Wind and Current Charts plus his Sailing Directions. The clipper ship, Flying Cloud, was captained by Josiah Perkins Creesy and navigated by his wife Ellenor Prentiss-Creesy who was the first person to navigate around the Horn by using the new route laid down by then-Lieutenant Matthew Fontaine Maury, of the national observatory at Washington. She used Maury's Sailing Directions and Winds and Currents. She gained and held the 89-day speed record of that route for decades. The old route was usually 100+ days from New York, around the dangerous Cape Horn at the tip of South America and then onward to San Francisco. Source: Flying Cloud by David W. Shaw (copyright) 2001. ISBN 0-06-093478-6 (pbk.) and Physical Geography of the Sea (1855) by Matthew Fontaine Maury. Physical Geography of the Sea by Matthew Fontaine Maury 1855. Physical Geography of the Sea and its Meteorology by Matthew Fontaine Maury (1861). The Pathfinder of the Seas, The Life of Matthew Fontaine Maury, by John W. Wayland, (1930). Professor Wayland writes, in the back of the book, under Chronology, that in 1916 the Virginia legislature created a law whereby "Maury Day " "..would be celebrated in all Virginia schools" (and it was); but it has been abandoned for unknown reasons. Wikimedia Commons has media related to Matthew Fontaine Maury. Obituary in: "Obituary". Popular Science Monthly. 2. April 1873. John Walker Maury (1809–1855), Mayor of Washington, D.C.